I tend to get sick around this time of the year. Probably due to the "small fire" in my Ba Chi chart, the "small fire" prone to be weaken by the cold winter weather, that's what I read from the fung shui books, believe it or not...I am not so sure about this theory. Lack of sleep is definitely one of the contributory factors in lowering my immune system thus cause my sensitive respiratory system being attacked. I was and still coughing non stop for the last two days; finally I sought doctor's help yesterday and got myself a day sock leave to have a rest at home. I felt slightly better after the medication but still a long way to total recovery. 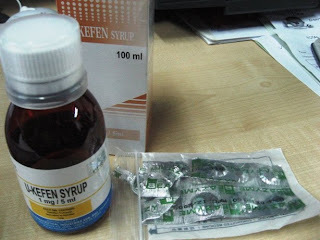 Hope to get well before Chinese New year. 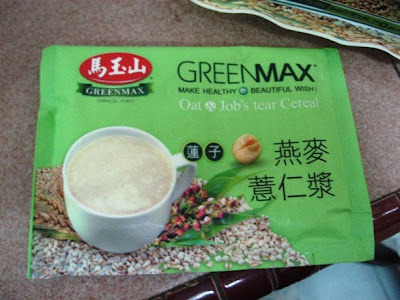 In the office, we are so use to having our breakfast, tea breaks and lunch on our office desks, we always get ready some beverage mix sachets in the office. 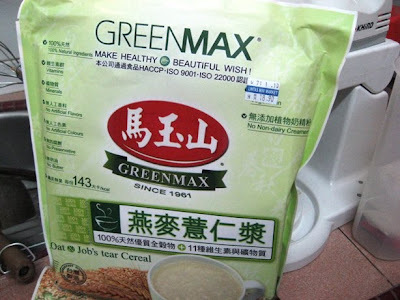 This is the one recommended by one of colleague recently, healthy drink from Green Max, product from Taiwan. There are many varieties you can choose from the supermarkets and you could also find them in the Chinese medical hall. 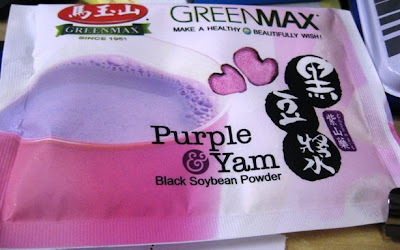 I bought 2 different flavours, Purple & Yam black Soybean Powder and the Oat and Job's tear cereal, from Lintas Supermarket at RM18.90 each, there are 15 individual packets in each. I have tried both drinks, I must say health drinks are normally not as delicious. I am yet to try the savoury ones. Chinese New Year is fast approaching; and my hair is greying. I believe it is genetically inherited from my mum and my grandma. I still can remember the look of my grandma was like an orang putih, because her hair was all grey, never thought that I have inherited the grey hair gene from her. 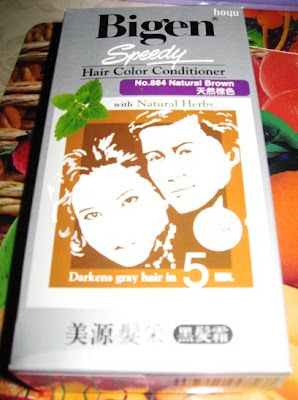 To reverse the appearance of my greying hair, I try Bigen brand hair colour conditioner, instead of black, I chose the natural brown colour to have a more natural look. I can not stand the long hours in the saloon (I haven't got the time anyway) so I DIY at the comfort of my home with the help of my hubby. Thank you dear. After 1 hour all my grey hair is gone, I mean is all covered by the hair dye. It is very easy to handle, just squeeze the gel on the brush and start brushing to cover the grey hair area, wait for 10-15 minutes and wash. No mixture kind of messy stuff to do. The last time I bought a lipstick was more than 3 years ago. Unbelievable. But it's true. Ever since I resigned from my previous job 3 years ago, I hardly used any lipstick, one can only find me with lipstick when I attend weddings and official functions. After I started working 1.5 years ago, times and times again I reminded myself to get a new lipstick but there is no urgency for me to buy any mainly because at my current work place, almost all of us in the office wearing nothing on the face to work, that is no make up at all. I conveniently follow suite. 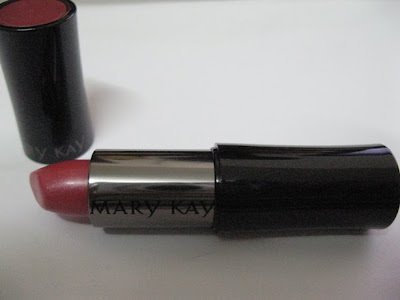 Only recently I bought myself a new lipstick from Mary Kay with a 30% discount. Knowing that the ones that I had already expired, it's high time for me to get myself a new lipstick. The 30% discount can only be obtained from online ordering for more than certain points in a single order. So few of us in the office combined our orders in order to meet the 30% discount requirement. This lipstick cost less than RM40.00 as a result. This is my new Mary Kay's Melon Rose lipstick. I am also looking at a AnneMarie Borlind lipstick to be added to my make up essentials soon. Crystal came home from school with a bunch of Taiwanese Pak Choy in a plastic bag. The Daddy was surprise and started to question her. She told her Daddy that she bought it from school to surprise me. Not that she likes to eat vegetable but she knows I always buy vegetable and must have a dish of vegetable in every meals if possible. I heard with disbelief when Clet told me about it after fetching Crystal from school this afternoon. 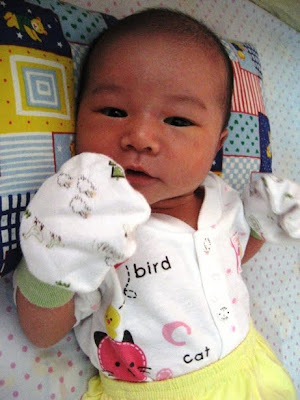 I was very touched with her act and the thoughtfulness that she possesses at her tender age. She spent her little pocket money to buy me vegetable from an elderly lady who is selling vegetable in her school. She said she is the only student patronising while the rests were all parents. We cooked the vegetable that she bought for dinner but she only ate a bit. It is just meant for me, she said. To avoid her from buying vegetable from school again which is not practical for her. I keep reminding her that mummy has got plenty of vegetable in the fridge so please do not buy for me. She just smiled. 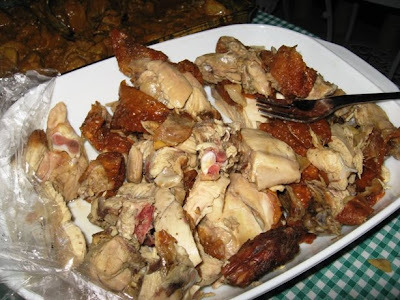 Since Christmas, I hardly got the chance to cook my family a proper meal. With so much celebration going on these 2 weeks, I only managed to prepare some very simple and quick meals at home or eat out. Today, I started preparing my cooking since 3.30pm. 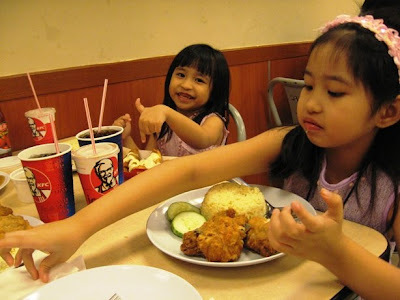 Aiming to have our dinner earlier so that our girls can go to bed early for the school starts tomorrow. Our girls love soup. They can just have the soup and rice for dinner. Less fuss. 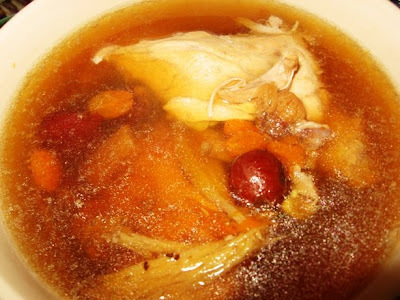 I prepared a pot of chicken herbal soup in the slow cooker just enough for 4 of us. 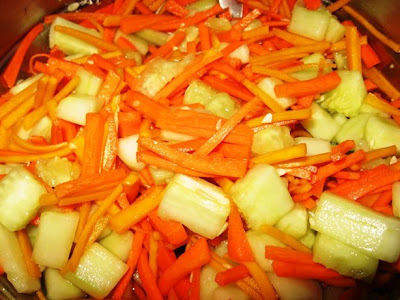 Mixing some cucumber, carrot and pumpkin into vegetable pickles using apple cider vinegar for marination. I tried the raw pumpkin for the first time in my pickles. Not bad! 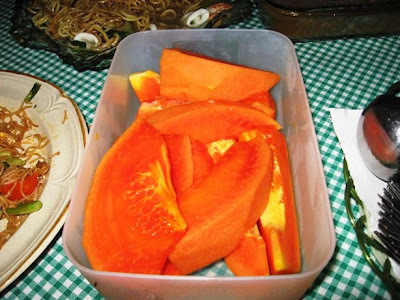 I learnt from my colleague that pumpkin can be eaten raw, its taste just like the not so ripe papaya. 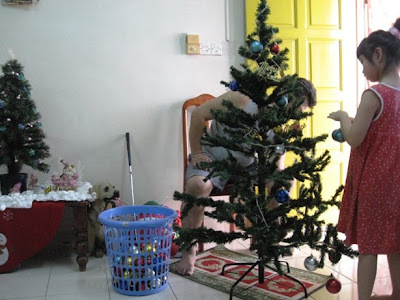 Christmas is over, a brand new year is ahead of us. 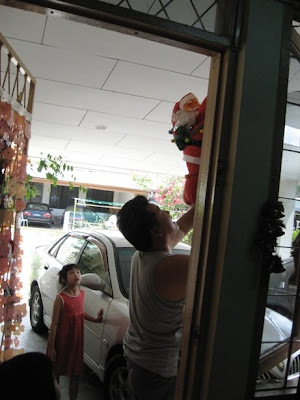 Before we got busy with the starting of school term and work, Clet with the assistant of, taking off the Christmas decorations today. It is a major task just to take all those decorations off, they need to be carefully wrapped and place into their respective boxes before putting into the big container for proper storage, so that we could still use them in the coming Christmases. Those Christmas decorations are becoming more and more expensive each year. I leave this task for Clet. Baking time for me during holidays! We love cheese. Yes, we do. 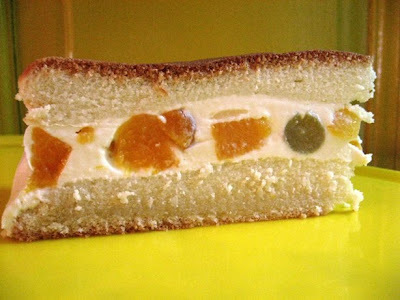 It's fattening but a bar of cheese can be shared with others if make into a cake. 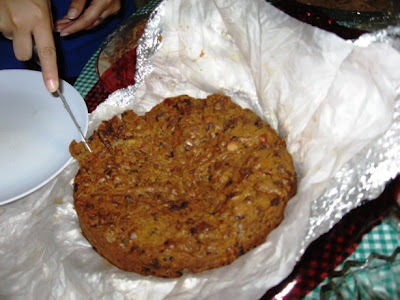 So here I am trying out to make a cheesy fruit filling cake for the first time. I did not realise that I ran out of cream, no dressing for my cake as a result. I received good comment on this cake from my mum :D, she is not a cheese person but she like this one. 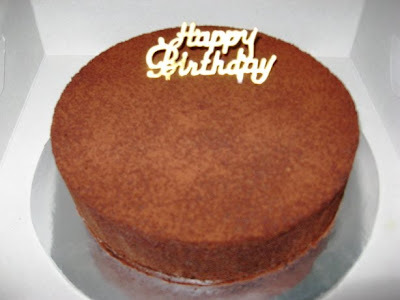 I also helped my niece to make a dark chocolate birthday cake for her friend. My sister bought the chocolate cake premix from Consfood last minute. The texture of this premix is not up to our desire, too dry. I will choose to make it from scratch next time though a lot of work needed. This is taken from Sacred Heath Cathedral. Crystal saw it from the back of the church and wanted to have a close up look at it. Simple and nice. 2009 has passed us by very quickly, we are now in the 2nd day of 2010. 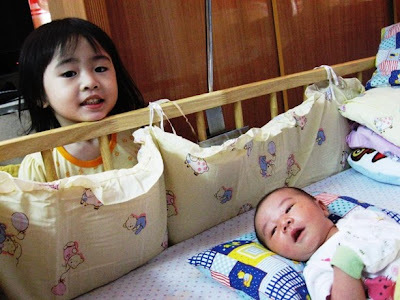 Kids will be going back to school 2 days later, resuming to hectic schedules for most parents including us as Crystal will be in primary 1. 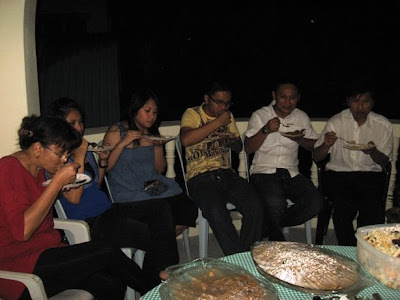 We had KFC as our last dinner for 2009 before heading to SIL's resident for the New Year's eve gathering which started late at around 10pm. It was a pot luck gathering. we brought in food respectively mainly for supper. 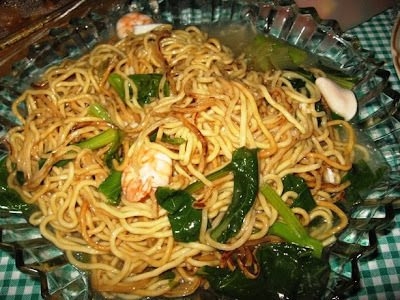 I was working on New Year's eve that I did not have time to prepare any home cook food for the gathering instead we ordered take away, mee basah, from a shop at Beverly Hills Plaza. This photo is upside down (I do not know how to fix it). 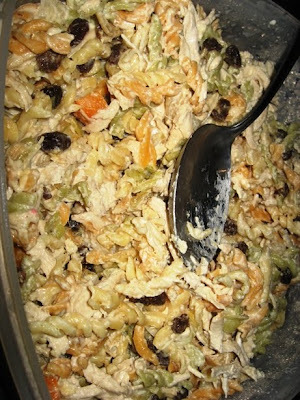 Pasta salad by Joyce. 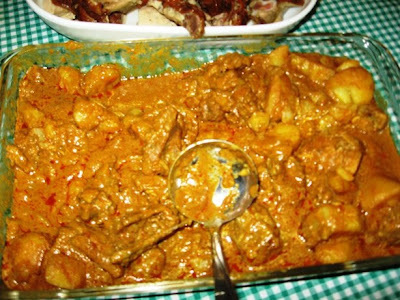 Very delicious beef rendang prepared by SIL, Monica. Can't help but tapau some home for my mum. 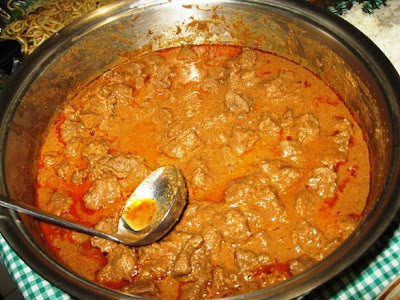 She loves beef rendang. 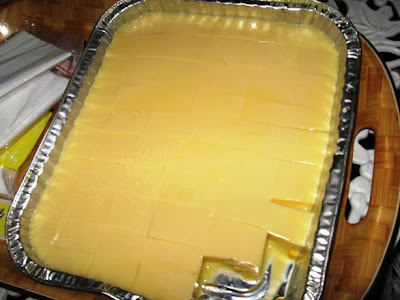 Sweet corns pudding by Monica as well. I was fast enough to take a photo before it's gone in minutes. Welcoming 2010. Joining hands for a better 2010. 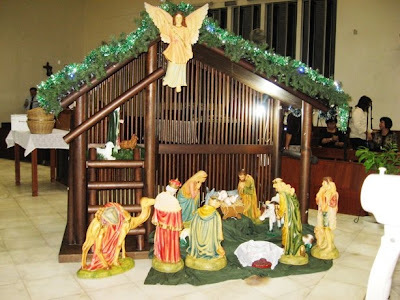 Better Health, Better Wealth, Safe & Peace on Earth.